This illustrated digital presentation will be given by Jim Almond (Shropshire Birder). “The Peregrine falcon is surely one of the most charismatic of birds. A supreme flier and aerial predator, the species is truly a local success story and now well established in good numbers within the County. This talk looks at the habitats chosen by Peregrines (including Shropshire’s unique tree nesting pair!!) and progress through a typical breeding season. It features an insight into the secret life of this magnificent bird with images, taken under schedule 1 license, showing the development of young birds and the behaviour of the parents during this time. 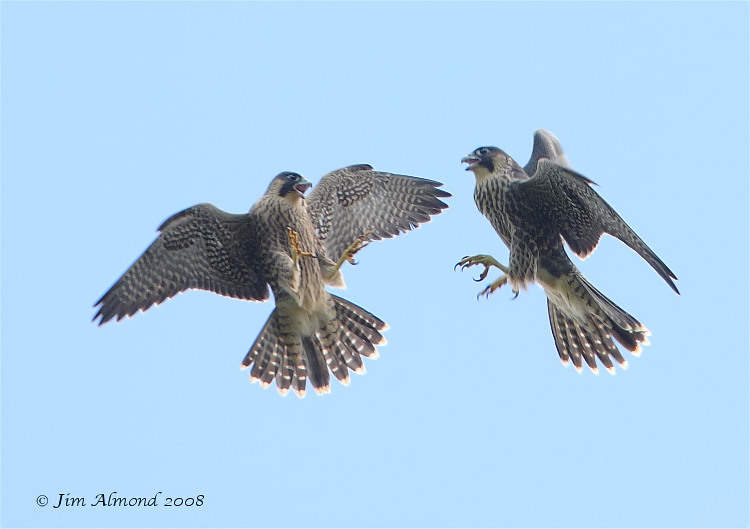 The above photograph, of 2 juvenile Peregrines, was taken by Jim.